Reclaimed Spruce with Rubio Monocoat Natural Finish. Charred Reclaimed Spruce with Rubio Monocoat Natural Finish. The design is inspired by the pattern of sedimentary mountains and rocks. 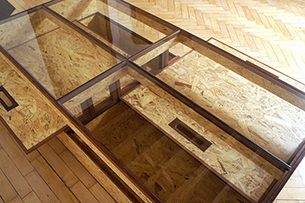 The desk was commissioned by Etsy Head Quarters to be the sculptural sleeve of their lobby desk. The desk is made of reclaimed spruce, FSC Beech, and finished with Rubio Monocoat natural and Rubio Monocoat white. 11' x 46" x ~17"
Made for artists Dan Graham and Mieko Meguro. The frame fits a Queen size bed and has locking casters. The sliders on the drawers are mounted underneath and are self-closing. The wood grains meet on a miter so that they continue and wrap around the face of the bed frame. 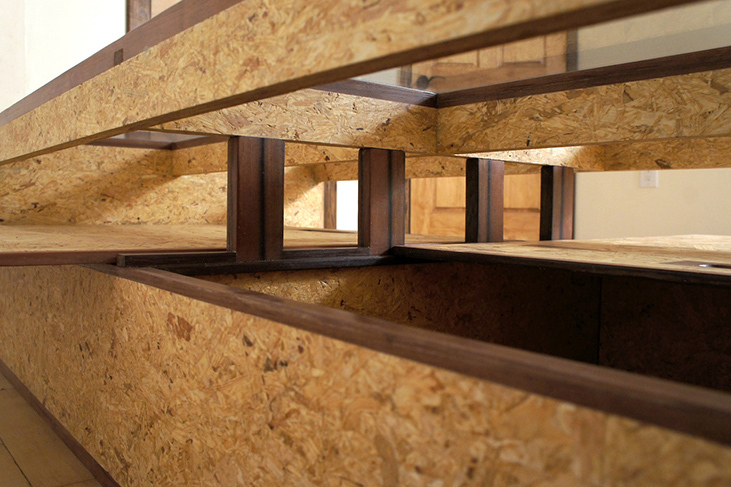 The cascade pattern flows from the curving forms of the top surface down to the bottom of the drawers. The cascade is interrupted by columns and frame. The dresser drawers rest on a sturdy hollow frame. The bottom tracks are waxed and the top tracks have bearings for ease of sliding. Finshed with satin lacquer. A reinterpretation of a dresser. The columns are for storing folded clothing or display and the top surface has a compartment for smaller personal items. Made with walnut, maple, steal, brass, rope, and leather. Lacquer finished. The flat drawer slides out from either side. There are three compartments. The coffee table is made with treated OSB, rosewood, and glass. Measures 60"x 28.5" x 15". Designed for maximum storage space with two 28" x 28" x 7" compartments that have sliding covers. SOCOTRA STUDIO takes the name from the Socotra Islands (an isolated land formation where over one third of its plant life is found nowhere else on Earth) as a metaphor for intimate growth, strangeness, and evolution as process. These traits are manifest in the uniqueness of the furniture we design and the custom furniture we build for our clients.